Atlanta’s Restaurant Week will take place in the Downtown Dining District from Monday, July 26 through August 8. The multicultural cuisine at Atlanta’s Restaurant Week includes that of traditional steakhouses, seafood restaurants, Irish pubs and Mexican cantinas. Choose a 3-course meal at any of the 26 participating restaurants for a price of either $25 or $35. No coupon, voucher or reservation needed. 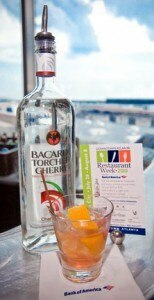 For more information, visit www.atlantadowntown.com/fun/restaurant-week. Keep up with restaurants in the ATL with our Atlanta Restaurant Reviews, News, Culinary Events and Atlanta Wine Dinners. The city sets its restaurant week apart from the rest by incorporating a signature cocktail; this year’s cocktail is the Bacardi Torched Cherry Blossom created by W Hotel Atlanta Downtown’s DRINKSHOP. If cherry isn’t your favorite, have no fear. We scoured the country for the top 10 crafted cocktails, concocted by talented mixologists at top bars. We’ll not only tell you where to get these handcrafted libations that use fresh ingredients, but also how to make them yourself!